For that weight, I'd consider moving up to Acme threaded rod at least and beef up the motors a bit. bdring wrote: A while back someone suggested using a NEMA 17 as my Z axis motor. This would get all motors to be NEMA 17's. I decided to try it as well incorporate some other ideas. It worked great and it is the current method I use for my axis. I will be releasing the drawings for it soon, and it will be new Z axis kit. It is a simpler than the old method as it uses a lot less of the "fold back" bearings. The fold back bearings were used to get greater engagement of the belts with the pulleys. It turns out that it was overkill and just using a pulley with more teeth does just as well. It is easier to show this rendering than try to take a picture of it. I like the design of your lift, but I'm wondering about strength. My honeycomb weighs 18 pounds, and aside from cutting balsa I would like to engrave stone, metal, and glass, so another say 10 pounds would not be unreasonable for me. Have you done any weight tests using your parts? Will they handle a 30 pound system safely? I found out the nozzles I had on order probably won't come in until the first week of January. Sorry for the delay for all who have requested them. Great thank you ~ I won't be tapping the hole just making a square cutout for a nut to fit into and drilling all the way through, if it works will post the drawing here Reprap WIKI and Thingyverse. It will be for the 5mm pitch 1.2mm thick Syncroflex belt as it not so easy to get the 80thou belt here in the UK. I may also try out 2mm pitch ball chain as a drive system ~ though im not sure that the 2mm pitch size is universaly avalible. There are alredy a few designs using the 3.3mm and 3.5mm diameter ball-chain on Thingyverse for Reprap type machines. I don't use those clamps on the design anymore. With practice, acrylic is easy to tap. Unfortunately, many people had nothing to practice on and broke a part or two. These tiny clamps were especially vulnerable. I switched to this style. The belt is tensioned by moving the idler pulley. I have attached the clamp drawing in case you want to use it anyway. 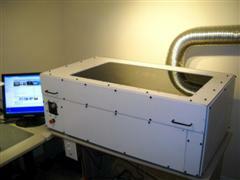 It is a PDF with a DXF as an attachment. Im trying to find the basic drawings for the flat perspex belt clamps I need to modifiy the drawing to suit 5mm pitch metric belt. I have not figured out a good way to share the 3D files efficiently. They change so often I would spend more time maintaining the on line versions than doing design work. I can probably provide STEP file snapshots of the design via email by special request to active forum members. Are you willing to share the 3D files/assembly? I have parts left from building a CNC router and want to adapt the design to save some money, (and to save a lot of time rebuilding the 3D files). I have no way to get history on the BOM. I suggest manually comparing the hardware on the list with the bag labels. Send me a private email if you need anything special. I still can't guarantee the list is 100% complete. It is my best guess. When I find or hear of missing items I add them. The kit contents page, is here. Do you so happen to have a difference list on the hardware kit? I bought the hardware kit a while back, and just purchased the Misumi parts, and then I just read this. I guess I'll find out the difference as I build, but a list would make it easy. I revised the frame, top cover and main assembly drawings. In many places the hardware was not actually installed in the model and estimated or counted on the actual unit. I took the time to put it in the model and updated the BOM as required. The BOM was off on Misumi t-nuts, but pretty close everywhere else. The hardware kits will be revised. I still want to give it one more look. I started a shared Google Document for build instructions. For now this seems like an easy way to collaborate on this. I might do a wiki page, etc later, but this is a good start. The link is here. I only spent about a half hour on it so far to layout a simple template for it. If you want access to edit it, please email me. I think you will need a gmail account to do it. Here is the link. I will work on it as time permits. The Z Lift has been updated. I ran a first pass to update the BOM. I need to double check it. A while back someone suggested using a NEMA 17 as my Z axis motor. This would get all motors to be NEMA 17's. I decided to try it as well incorporate some other ideas. It worked great and it is the current method I use for my axis. I will be releasing the drawings for it soon, and it will be new Z axis kit. I did similar updates to the XY Mechanism. I change the belt clamping method and put the bearings in pockets. The bearing cut can still be cut through if you want to fab them on a laser. You tension the belt by moving the back pulley. Tighten the back pulley screws until it can still slide, but it takes a strong push. Now push it back until the belt is tight and fully tighten the screws. I will update the BOM later today. Yes, it will still work the old way too. Just cut through at the full diameter of the bearing. 2. I changed the idler bracket to use a pocket instead of using an o'ring to hold in the bearing. It seems like this change makes it harder for the design to be done on a laser cutter. Or at least I haven't figured out a reliable way to do this on ours. I made some tweaks to the X axis based on some things I learned on other projects. 4. I also removed "non-commercial" from the license. This is to make it more in line with the new open source hardware (OSHW) direction. The drawings page has this license as well as the revised drawings. The drawings will update as they are revised. 5. BOM updated per above which affects the kits. There will be some similar changes to the XY assembly and Z lift. I was setting up a fourth stepper for the 3D printer extruder. I was using Mach3 as a test controller. I decided to play with tangential knife control while I was at it. Tangential knife cutters rotate the knife while cutting, so the blade is always pointing in the direction of travel. They work much better than drag knives, especially on thicker materials like gasket material. I only simulated this by setting the knife stepper next to the machine with a little paper knife taped on, but it all worked as advertised. The only issue is that Mach3 reverts to exact stop mode in tangential mode. This means that things like ellipses are going to be really slow. If you don't need anything but lines and circles it should work at a decent speed. I might make a carriage for this and create a video of it in action. I finally got a chance to post the drawings for the enhanced Z Lift parts. They are on the drawings page. I will probably post a kit in the next few days. I have been gluing the parts together with an official acrylic glue, Weld-On 16. So, I will probably ship them assembled. Note: This is only recommended for people who want to eventually add a 3D printer or other add on where the Z axis needs to very stable. No I purchased power supply from LightObject and tube from love-happy-shopping. So you built your own laser tube and PSU to stay within the budget of $1000 dollars? I'm looking at the BOM list and you never mentions a laser/powersupply. I downloaded and printed off your PDF on how to build a PSU and LASER. Is that what you used? how much did that cost you, compared to buying one from ebay? The I.C. near the input is a SN74LS06N, hex inverter buffers/driver. This is socketed, so I will try to install a new one. Yes, the front end of the laser power supply is the side with all the terminals. In all seriousness, the front end of my supply appears to start with an optocoupler. It would seem difficult to burn anything up beyond the optocoupler. I highly doubt anybody is handing out schematics for them. I was messing around with the RepRap motherboard controlling the laser. Now the laser is not firing. I think I lost the common ground between the RepRap and the laser power supply. If I measure ground to ground on the scope, it jitters around between +/- 2-3V. This means the power supply enable pin was seeing in excess of 7-8volts. Something made a bit of a buzzing sound before it stopped working. I cannot fire it using the high or low enable. Does anyone know the front end of the laser power supply before I tear it out? eBay is a good place to start. LightObject.com also sells them. It is good to do some searching because there are always some hidden deals out there. I'm sure this is an oft-asked question, but I haven't found it yet - where did you get your tube & the electronics for it, and how much was it ? I get asked via email about build cost often, so I am adding a post about the topic. 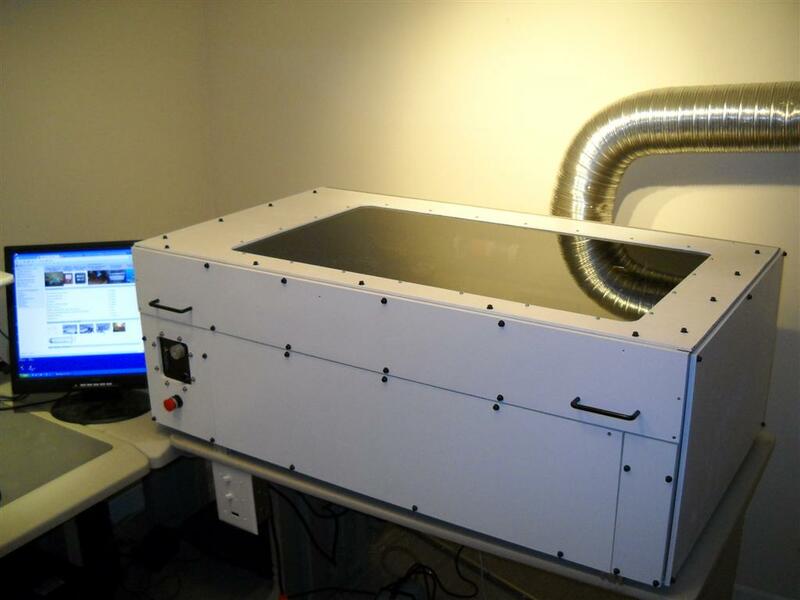 When I started this project I set a goal to be able to build a laser cutter for less than $1000. Was I able to do it? I definately had less than $1000 invested by the time I was able to cut a shape with the laser under CNC control. I was not starting with an empty shelf though. I already had a lot of the cheap stuff like nuts, bolts, wire, terminal blocks. I also cut all my own parts on my router, some of it from scrap material. I used cheap surplus things like stepper motors, etc. Since that time a lot of feature creap has raised the price. Non essencial things like a gas spring assisted cover, assist air pumps and high end stepper drivers raised the price a lot. I have the BOM on line with realistic, if not weighted high, prices. It does not contain prices for the electronics or the tube. Each person is going to start with a different amount of parts and a want a different amount of optional items added. If you only have $1000 to spend and don't have some material and cannot make you own parts, I would not start the project. I would suggest $1200 is probably closer. Do the math yourself, before you start the project. Note: Remember this is open source. Feel free to make things yourself from the drawings. I do not make any real money from selling my kits. Don't feel any obligation to buy from me. If you want to help the project, just donate to it. I installed a Gecko G540 in my laser. See my blog post for a review of the product and install. I wanted a four axis for some experiments with atangentail knife cutter and I wanted a smoother driver. The interface on the G540 is not ideal for controlling the laser enable quickly, so I made a breakout cable. I will be adding to the cable, but this will do for testing. Below is a photo and schematic. click the schematic for a bigger view. the scaling the forum adds makes some lines disappear. I get asked all the time if there are detailed build instructions. Right now the answer is basically, no. Some assembly drawings have some build information. Other than the buildlog itself and the forum, that is it. I have about 20 things on my project todo list and time for about 4 of them. Some people have offered to help, but no organized effort has started. I can help, but not do the whole thing. I was thinking about starting a wiki for this. This way anyone could contribute and it would stay more organized than a build log. Does anyone have any recommendations for good wiki software. I would like it to be free, open source, self hosted and popular enough that it won't go anywhere soon. MediaWiki comes to mind...is that a good choice or overkill? The wiki could also have some general info sections. Adjusting is very easy. It is done before attaching the z slides. I used the gantry as a reference point. I raised the platform close to the top. I then measured down from the gantry from the highest corner with my caliper. I then raised each corner up to that point by rotating the t nuts up. You lift the corner so the t-nut is free to rotate. This will get you to with 0.013" worst case. (1 / 18 tpi / 4 t-nut points). If you want to tweak out the last few thou you can loosen a pulley from the rod and spin it a little. I got it to within about .004" and left it at that for now. That is pretty good over 2 feet of width. You might need to repeat the process a few times. If you measure the height as close to the rods as possible it is less likely to change. Then attach the z slides. They just prevent XY motion. That is an excellent solution. Yes, an acme rod would be an improvement over the old threaded rods, but this is a rock-solid solution that should give even better results. How easy was it to level the build platform the first time? Some closeups of the new mounting brackets for the build platform would be enlightening. I don't have any issues anymore. Even ACME thread would still need a track to meet the stability I have now. You know, good acme threaded rod is not that expensive. You can buy it and the nuts from McMaster and other places. Cheapest is 1/2-10 at $31.20 for 6'. It will solve a lot of wobble issues. In preparation for the 3D printer head I am adding, I upgraded the Z Axis to improve it's smoothness. Previously the table ran up and down on leads screws only. This worked fine for adjusting the height. But the table would shimmy a little due to some lead screws not being perfectly straight. This is not an issue for laser cutting, but it will show up as vertical imperfections when printing. I added some Misumi 20x80 vertical extrusions with v track and v groove bearings. I also decided to switch to a NEMA17 motor and MXL belts. This will make all of the motors, belts and pulleys common. I decided to do a 2:1 ratio for more strength by making the motor pulley 18 tooth and the lead screw pulleys 36 tooth. The 36 tooth bigger lead screw pulley probably removed the requirement for folding back the belt on the pulley, so I removed all those extra bearings. I had my digital camera ride the table up to show it's smoothness. The clicking is a non straight lead screw, but it does not affect the smoothness. I think it makes more sense to keep them all NEMA17 to keep the costs down, as well as making sourcing the parts easier. I wasn't sure if because of all the threaded rods in the Z-Axis, you needed more power. Given it's not having to move quickly or often, I figured it was based on parts you had lying around. I added a second pattern to the Z lift motor plate for a NEMA 17 motor. This will get all the motors to be the same size. On this version I think I will use MXL belt and pulleys. I geared it down 2:1 so the motor should have plenty of power. I'll order the parts and give it a try. I will probably time the install with the MakerBot upgrades. Note: The belt does not look aligned right because it is still on the old Nema 23 parts which are hidden. Good question. you are not the first to ask. I started the project with a bunch of parts left over from a wood router that was replaced by a bigger one. This included 3 Nema 23 motors. My first iteration of the project used these motors. As I refined the project, wanted lighter and smaller motors for the XY Mechanism so they were replaced with NEMA 17s. I did not have weight or size issues with the Z so I left it at 23. I should look at changing that one also. Maybe I could put both footprints on the motor mount. I will look into it. Maybe I could use the same belt pitch as the XY too. Why did you choose a larger stepper motor for one axis? Which axis is it for?